We started our small country kennel here in north central Indiana in 2005 with one goal in mind, to provide quality loving family pets to families wanting to add a new member to their home… We’ve always owned golden retrievers, and loved their loving temperament and intelligence, but we saw a need for this type of dog in a smaller, more manageable version. After researching the miniature goldendoodle breed, my wife Angie and I along with our partner Mike King, decided this would be the dog that would best fit these needs. Combining the golden retriever’s qualities with the non shedding hypo allergenic qualities of the miniature poodle, results in a dog in the small to mid size range, in a wide array of colors and coat types. Mini goldendoodles grow up to have great temperaments, very trainable, with minimal shedding…making them a wonderful, low maintenance pet. Mike and I have worked together at UPS and raised hunting dogs for the past 20 years. Already having several golden retrievers between our families, we started the search for two miniature poodles, of different colors, to be the dads of our mini goldendoodles. The process of finding miniature poodles with the temperaments that we were looking for proved to be harder than what we thought ! In the end, we found that raising the miniature poodles from puppies with our goldens, as if they were goldens, worked out best. Allowing them to run to the barn, explore the many things going on our farms, play in the creeks, sleep in our homes and generally be as big a part of our families as our goldens already were…made them wonderful well adjusted miniature poodles all their own…Toby is our white miniature poodle weighing in at about 8 pounds and Chewy is our red miniature poodle who also tips the scale at 8 pounds. Although Toby and Chewy think they’re equal in every way (including size), to our registered golden retriever moms, the breeding process has to be done thru artificial insemination. 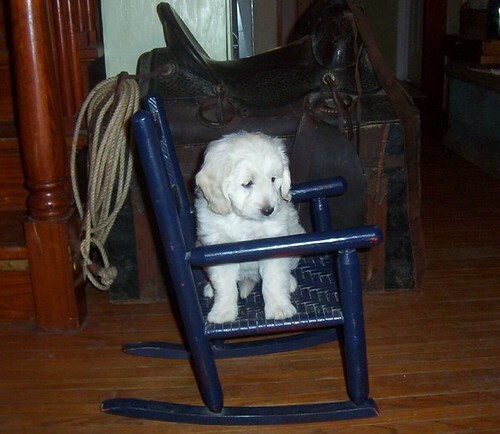 Having two country homes to raise our puppies in, it allowed us the unique opportunity to expose our puppies to many new experiences before they’re ready to go to their new families. Puppies can spend equal time at both our country homes and time with both our families allowing us to give them lots of personal attention even when we have several litters at a time. Something most kennels don’t have the opportunity to do. With our kids, nieces, and extended families, the puppies get lots love and playtime with others besides ourselves. This allows them to be more well adjusted little puppies when they go to their new homes. The puppies also have the opportunity to explore our homes and our properties, interacting with other animals including trips to the barn to see Oreo the cow, Jabez the sheep, Ellie our goat, Ike and Charlie the miniature horses, Cogburn the rooster, and several barn cats ! This lets them experience life outside in the real world, as opposed to spending their first weeks in a kennel. We also take the puppies on car rides and introduce them to crates that will help if you want to crate train after they arrive at their new home. All of these experiences make for a well rounded well socialized puppy.